It's no secret that we love Peter Pan in our family. You know that I played the role of Peter Pan in 2007, the winter before Lucy died. You know how much she was enamoured with the show. You know that she watched with rapt attention each time she came to the theatre, dressed in her Tinkerbell costume. You know that when we found out we were having a baby boy, just a few months after Lucy left us, that the name Peter was all too perfect. And oh, how I bonded with my Lost Boys from that show. They have all grown up now. Two are attending college at the Manhattan School of Music, one at the University of British Columbia, and a few here in Utah. They are still involved in the arts and such wonderful, fun, talented boys. I have such fond memories of running around the stage together, swinging on the set, belting our hearts out and making mischief. But a few years ago we met a real lost boy. Several of them, actually. But there was one in particular with whom my husband and I bonded. His name is Abraham and he is amazing. Amazing Abraham. Vic and I had been invited by our friends, Scott and Kelly Wolf (name dropping, I know...but they are so great) to a fundraising event for their foundation, the Chier Foundation. This foundation helps "Lost Boys" living in Utah to attend college. The reason Scott and Kelly named their foundation "Chier" Is because of what one of our Lost Boy friends once said, "Chier is our word for 'North Star', a star we followed on our journey through the desert. Which means all young boys from Sudan who came to America will shine like that star in the future and they will help to build a new Sudan." Luckily, I knew exactly what a "lost boy" was before attending the event. Years earlier, we happened to pick up a DVD from the library; it was a documentary about the Lost Boys of Sudan. It completely riveted me. It is safe to say that this film has stayed with me and impacted me more than any other. Since then, I have been utterly fascinated by these boys and what they have been through. Their stories are absolutely incredible and heartbreaking. And I knew there was a group of them living in the Salt Lake valley...I just never dreamed I would one day be a part of their lives. From 1983-1999, the Sudan People's Liberation Army (SPLA) and the Sudanese Government had been at war in southern Sudan. The conflict claimed more than 2.5 MILLION lives and displaced huge numbers of people. Among these were at least 20,000 children, mostly boys, between 7 and 17 years of age who were separated from their families. These 'lost boys' of the Sudan trekked enormous distances over a vast unforgiving wilderness, seeking refuge from the fighting. Hungry, frightened and weakened by sleeplessness and disease, they crossed from the Sudan into Ethiopia and back, with many dying along the way. The survivors are now in camps in Kenya, the Sudan and Uganda. In 2001, as part of a program established by the United States Government and the United Nations, approximately 3800 Lost boys were allowed to resettle in the United States. They are now scattered over at least 38 cities, most of them orphaned, having lost MULTIPLE family members in the war. Eventually, the separate nation of South Sudan was formed. Abraham was one of those boys who left home at age SEVEN to escape the violence. He was tending cattle outside the village when the violence broke out and was able to flee. Can you imagine wandering for 3 years through the barren wilderness at age SEVEN? Escaping wild animals, having nothing to eat, and not knowing if your family back home was dead or alive? I cannot begin to FATHOM Peter experiencing something like this. So there we were...at this fundraising party in Park City in a beautiful, gigantic home. The architecture and the catered food, the music, the lights, the things people were wearing...it was beautiful. The moon was full and heavy and the snow outside sparkled. But the most crushingly beautiful thing were the smiles and the spirits of these lost boys. I was honored to be in their presence. When the boys found out Vic was an immigration attorney, they flocked to him. We shared our story of losing Lucy, and were, in a way, able to bond with them. And that's how it all began. 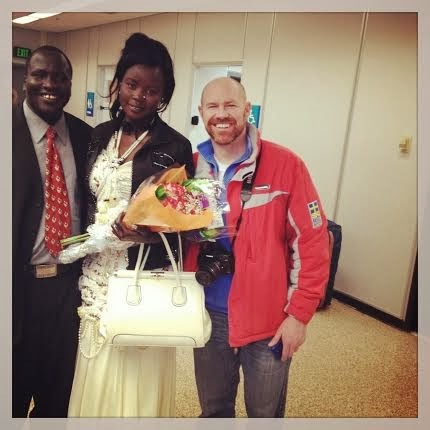 Abraham was able to return to Sudan a few times, and on one such occasion he married a childhood friend, Adhieu. But due to immigration issues, she was unable to return to the U.S. with him. 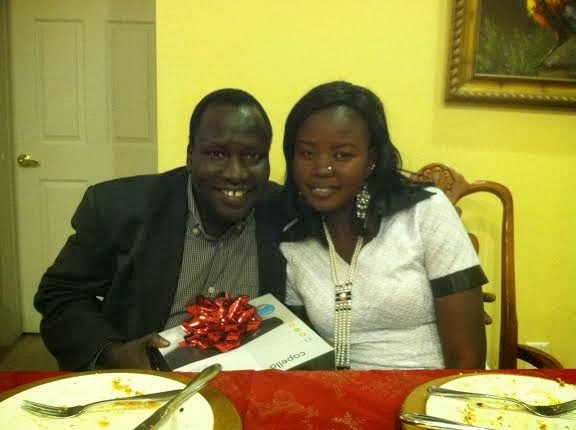 Vic got everything into order for her, and after waiting for over a year and a half to be reunited with his wife, it finally happened last month! Since then we have been busy fundraising for them in order to buy them a washer and dryer, a vacuum, bedding, winter boots, socks, pots, pans, dishes, and other essential items. (Abraham was living such a bachelor life before his wife arrived...sleeping on JUST A MATTRESS. He owned no silverware or dishes) Due to the generosity of so many, just this very night I installed the washer and dryer and put their new vacuum together. It was such a trip to show Adhieu how to run the dishwasher, how to use a vacuum, and to tell her that no, you do not fill up the washing machine and then wash the clothes by hand in the water. Such different worlds we come from. (His wife was effected by the war as well. She lost her father and ALL FOUR of her brothers). "I have nothing to give them to say THANK YOU. But please tell that God will bless them." The other remarkable thing I've noticed each time we give them something, is that they are grateful for the item, but you can tell they are not attached to "things". They have very little clothing, just the essentials, and they are not burdened down with too much "stuff." Their focus is on good food, good company, and simply... love. We had them over for Christmas dinner. They came in their very best clothing, having just come from an Episcopal church downtown, where the Sudanese population of Salt Lake had gathered to say prayers for their country, which is in the midst of yet another war. We asked them if they knew anyone effected by the latest outbreak of violence. "Yes. We know many people who have lost friends. But it is a way of life for us. We are sad. It is horrible. But it is part of our lives." They thanked us for dinner, they beamed at the DVD player we gifted them, and they headed back out into the dark cold night together. With their black skin and their beaming eyes, they left a trail of light behind them that only those made beautiful by crushing pain can emulate. I love that I was once the "leader" of the Lost Boys of Neverland and that "Neverland" is where Lucy now resides. I love that I have a real Lost Boy in the flesh as a part of our family's lives who followed the "Chier"...the "Star" that led to his eventual freedom. I am humbled to be in their presence. And I'm humbled by all of the help you have given them. THANK YOU. And as Abraham said, "God Bless." 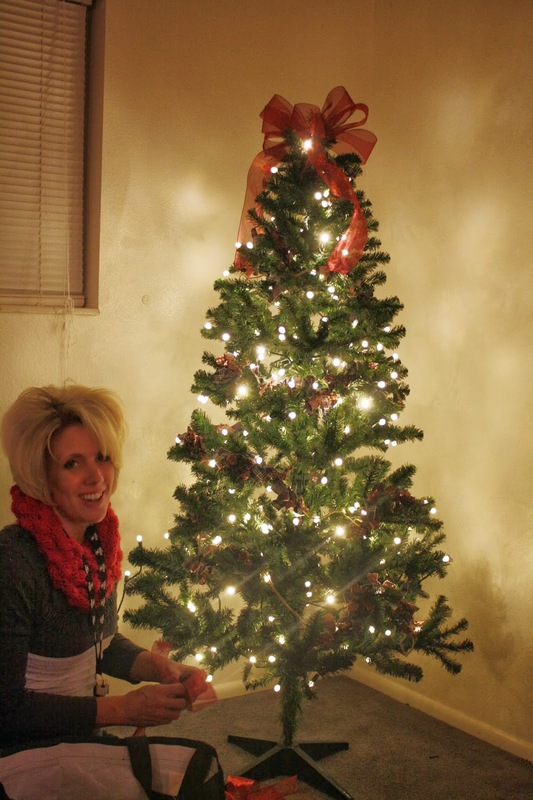 Jenny Towery setting up their first Christmas tree. 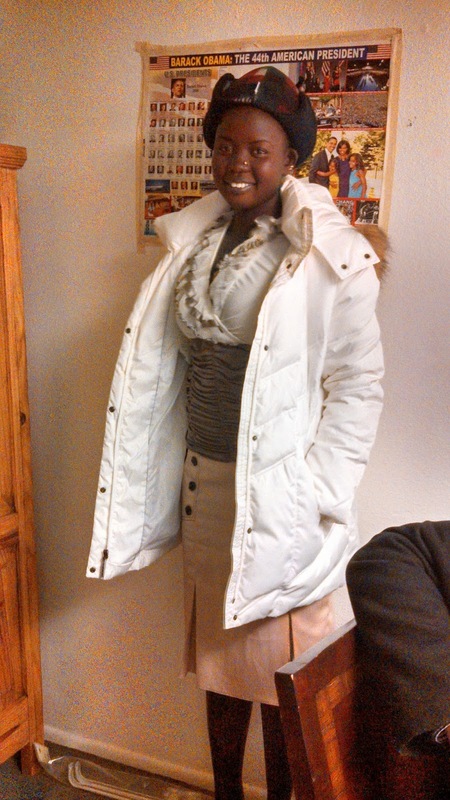 Wearing the gorgeous coat that Cristi Bastian donated and a winter hat from Susan Hale. Zoë was obsessed with Adhieu's beautiful skin. 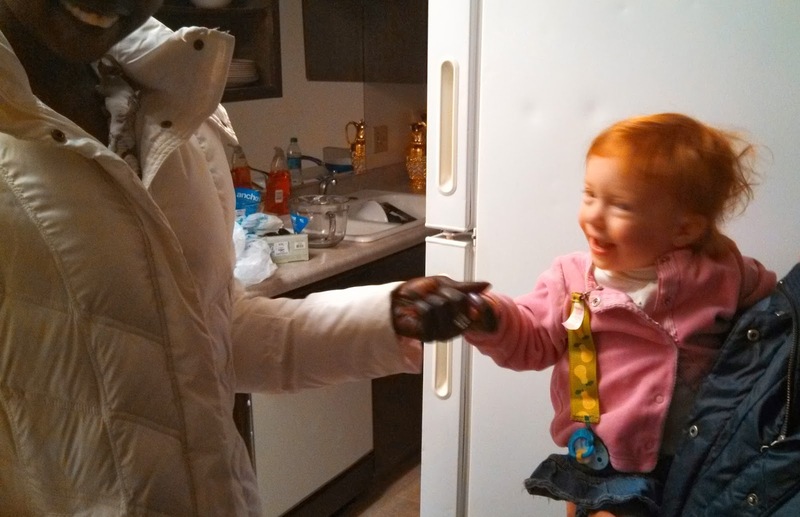 And it was the first time Adhieu had ever met/seen a red head!! And so much more not pictured. Thank you to everyone who donated money, items, time, and expressed their love, care, and concern for these amazing people. I will keep you posted on their new life together in America. I hardly ever comment as I am a lurker. But... this post is simply beautiful. I loved the lines, They thanked us for dinner, they beamed at the DVD player we gifted them, and they headed back out into the dark cold night together. With their black skin and their beaming eyes, they left a trail of light behind them that only those made beautiful by crushing pain can emulate." Beautiful! We will never know all they endured. Thank you for sharing their story. Your efforts are exactly what we are supposed to do everyday - Mourn with those who mourn, lift the burdens of those around us, being Christ's hands, etc. Simply beautiful. My favorite: "they left a trail of light behind them that only those made beautiful by crushing pain can emulate." Beautifully written, Molly. 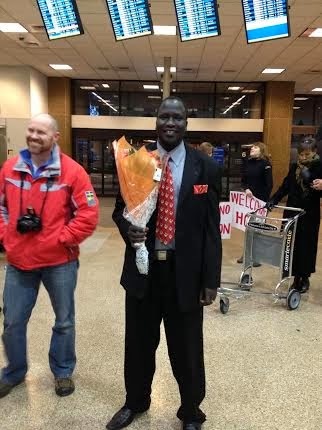 What a great gift to the Sudanese in SLC to honor their challenges by sharing their story and struggles with all of us. Abraham and his brothers of lost boys are blessed by you and the many who are giving, serving, loving, embracing, and lifting them and others like them. We have huge populations of refugee immigrants in the Twin Cities. In our ward, we have a group of Nepali and Karen people--people who have suffered, fled, arrived, and now...figuring that out. All of them with that same light burning through the difficult memories and grasping onto a new reality and what that means for them and their families. Thank you, Molly & Vic, for your selfless service in reaching out and for the community of givers that you have created by reaching out--we can all do SOMEthing for those around us in need, this is a great lesson of which to be reminded regularly. I remember learning about The Lost Boys about 7 years ago when one of them was a student at the university Trevor was attending & I was working--during international education week there was a panel discussion and information sharing. It was fascinating and heartbreaking. To imagine it all...gah. God Bless Abraham and his beautiful wife. And all of the lost boys throughout the world. So so neat! I hope they are able to find peace & love here - you are so wonderful for organizing & fundraising behalf of them!! I have not commented before either but this post is beautiful! My husband and I worked with some of the Lost Boys of Sudan in Kenya and were forever touched by their stories of loss and hope. What a meaningful way to help them get on their feet in a new country. Thank you for sharing! What a beautiful post about your friends. I took my little grandson to McDonald's one day. There were several very young boys and several teenage boys with this couple. The little boys played and played while the bigger boys ate their meals. My grandson was so thrilled that they wanted to be his friend. The little boys chased each other, laughed, and just had a ball. When they were ready to leave, I asked the woman, "Are these your children?" She said, "No. 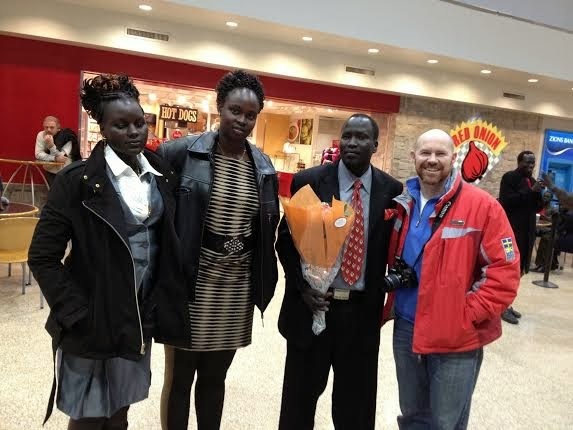 They are from the Sudan and came here as refugees. I work with them to get them used to the bus, trax, stores, exchanging money, customs, etc." When my grandson saw that they were leaving, he said, "Grandma I want to tell my friends bye." He waved and waved and said he wished they could stay and play. Here were these cute little children, different skin, born worlds apart, different language but laughing, playing, having fun - they saw nothing unusual. There was no judging, no thinking about the differences...just kids playing and having fun together. I too hope the boys' lives are full of hope and they find good people where they end up living who will love them they way you do your friends. Thanks to you and Vic for always showing us what this world needs so much...love, peace, hope. This is incredible in every way. Wow. Just wow. Such a beautiful story, Molly. Thanks for sharing! So much we can learn from this incredible couple ( & people ). Absolutely incredible. Thank you so much for sharing. Your sorrows are great Molly, and so are your blessings. I envy your ability to serve. I envy that Heavenly Father places these great people in your life and trusts you to take care of them. You are so very special, so very blessed.